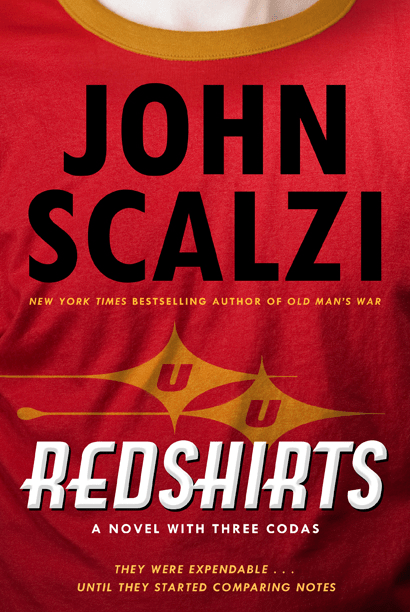 Today’s writing links highlight prominent sci-fi author John Scalzi’s new announced project, Redshirts. For those of you who are unfamiliar with the term, Redshirt comes from Star Trek lore, referring to the expendable red shirted crewmembers who were always fodder for whatever alien culture they encountered in an episode of the show. If you still have any trouble understanding this phenomenon, go back and watch the original Star Trek episodes. Anyone in red standing next to William Shatner when they arrive on a new planet has a life expectancy of about zero. Scalzi’s attempt on the subject will humorously explore what would have happened if the new redshirt recruits got together to compare notes and finally took notice of the unusually high mortality rate for their position. More details on the synopsis can be found on the website for the always fantastic publisher, Tor. Redshirts won’t be out until Summer 2012, but it will be worth checking out when it releases. In other news, Happy Halloween and here are some links! This entry was tagged Conor Dempsey, Halloween Writing Links, Jenny Milchman, John Scalzi Redshirts, Karen Elliott, Michael Dempsey, Monday's Writing Links, science fiction writers association, Terry Pratchett's Snuff.